Thursday, September 1st marks the start of the 2016 Second Life Concerts to Benefit Stand Up 2 Cancer (SU2C). 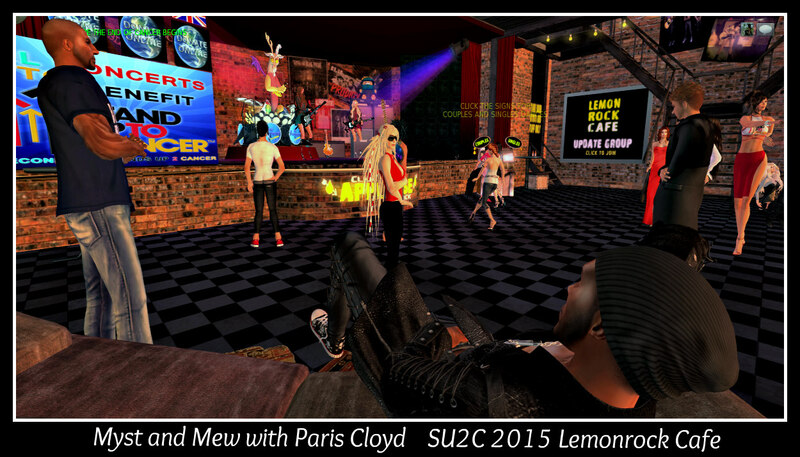 Building on the success of the 2014 and 2015 seasons, this year sees Second Life Concerts to Benefit SU2C running throughout September, featuring 40 venues and over 160 performers giving concerts and holding events across the next 30 days to raise money for the international Stand Up 2 Cancer campaign. Led by Still Braveheart, SL Concerts to Benefit SU2C is now an established part of the Second Life calendar, presenting people with the opportunity to attend events in-world, enjoy great concerts and music, donate to SU2C through donation boards, or if they prefer, follow links to donate directly to SU2C activities in their preferred country – Canada, the UK or the USA. In addition, people can also donate through the Second Life UK or US team pages for SU2C. 1st Chapter Plaza, Acoustic Cave, Ashley’s Oasis, Bonaventure Square, Caitinara Bar, The Galleria of Fashion, Bound Elegance, Breakers, BS’s, Café Musique, Chain of Love, Coffee House and Fireside Chat, Coffee’s Live Music Venue, Chicago’s New Place II, Ce Soir Tonight, Free Spirit Farms, Gspot Club, Kultivate Magazine, Lil Reds, Lovekats, Mi Casa, Su Casa, MPW Church and Music Venue, Moonshine & Roses, Party Beach Scheveningen, Place of Grace, Quinn’s Place, RMS Titanic, Smokin’ Aces, Spin Club, Solarwinds Music Live Club, Stargazer Café, The Dirty Grind, The Hollywood Ballroom, and Theatre, Lemonrock Café, The Only Venue, and Tricksters Sounds. Given this is a month-long season, providing the entire schedule here is impractical – so instead, please refer to Still’s own blog for the daily list, or check the SU2C SL Google calendar, or visit BS’s in-world for updates, where you can also find the SL Concerts to Benefit SU2C auction boards, and bid on the time of one of SL’s top entertainers. SU2C takes an innovative approach to ending cancer by focusing on forming “dream teams” of doctors and researchers who are directly involved in leading-edge cancer research and treatment, and then undertaking aggressive research programmes. 100% of all donations made through SU2C goes directly into funding cancer research and treatment and paying for these teams; none is lost to “administrative costs” or put aside for CEO or executive salaries, etc. From September 12th through September 27th 2015, live performers, DJs, entertainers and venues from across Second Life came together for two weeks of music and entertainment to raise money for Stand Up 2 Cancer’s world-wide activities in funding practical cancer research and treatment. That’s around US $11,784.47. As per SU2C in Second Life’s stated aim, the money raised will be divided equally between SU2C’s work in Canada, the United Kingdom and the United States. “I watched so many of you put aside everything to come together and make this so successful,” Still states in her blog. In addition to being able to make donations in-world, those in the USA and UK also had the option to donate directly to SU2C’s work in those countries to the SU2C in SL Team Pages – and these amounts have yet to be included in the above total. Doubtless, Still will announce those figures as soon as they are available. In the meantime, the full transaction report for in-world receipts of donations received through the kiosks and boards placed at the participating venues is available, although as Still notes, it may be liable to additional revision and tidying-up. Congratulations to Still and all who were involved in SU2C 2015, whether assisting in the organisation, or as venue owners, performers or supporters. And here’s to 2016! Stand Up 2 Cancer provides an innovative approach to ending cancer, which puts funds directly where they are needed: into leading-edge cancer research and treatment, and undertaking aggressive research programmes through what is called Translational Research. 100% of all donations made through SU2C goes directly into funding this work, none is lost to “administrative costs” or put aside for CEO or executive salaries, etc. Stand up 2 Cancer In Second Life, organised by Still Braveheart, this weekend reaches the half-way mark in a marathon series of concerts and DJ sits taking place at over 40 venues across the grid and which features over 150 artists, performers and DJs. The events are to raise funds for Stand Up 2 Cancer (SU2C) and their ground-breaking and innovative approach to ending cancer, which puts funds directly where they are needed: into leading-edge cancer research and treatment, and undertaking aggressive research programmes. 100% of all donations made through SU2C goes directly into funding this work, none is lost to “administrative costs” or put aside for CEO or executive salaries, etc. Since launching on September 12th, Stand Up 2 Cancer in Second Life 2015 has already brought-in donations of almost L$800,000 (approx US $3,200) in the course of its first week through in-world donations alone (people can also donate directly through the SU2C SL Team web pages – see the links at the end of this article), which has been a phenomenal response for SL residents. The best way to keep fully abreast of SU2C activities in-world is via the Google calender of events and via Still Braveheart’s blog. – and remember, SU2C runs right through until Sunday, September 27th. In the meantime, here’s the weekend’s line up, which may be subject to last-minute changes. As always, all times SLT. Where a time or venue has ” against it, it means it is the same as the last entry to provide either. Saturday, September 12th marks the start of the 2015 Stand up 2 Cancer (SU2C) campaign in Second Life, and the venue schedules are shaping up nicely. I previewed this year’s campaign, at the end of August, so feel to treat this as a small update / teaser. This year builds on the 2014 début event, which saw L$ 1.5 million raised over 4 days, and will see more than 150 performers, DJs and tribute bands perform at around 40 venues across Second Life in two weeks of music and fund-raising to assist the ground-breaking work of Stand Up 2 Cancer. Activities commence on Saturday, September 12th and run through until Sunday, September 27th, all brought together through the leadership of Still Braveheart, who pioneered the 2014 inaugural weekend. As I noted last time around, the focus this year is not only on a much broader time span for fund-raising, but it is also looking to support far more of SU2C’s work by splitting donations between SU2C’s activities in Canada, the UK and the USA. In addition, people will be able to donate directly to SU2C’s work in through three countries by following the special donation links available at all participating venues if they’d prefer to pay direct, rather than via in-world L$ donations. Obviously, with so many performers and venues participating, listing them in a blog like this is impossible – so do please keep a track of the SU2C in SL event schedule on Google, and via Stills’ own blog, which will have daily events, times and LMs to venues as things get under-way, as well as all the very latest news. However, to help whet appetites, here is a small sampling of what is to come (note schedules subject to possible last minute change). So, do please keep an eye on Still’s blog for the full schedule of events, together with the Google calendar, and who knows – we might bump into one another at one of the venues! If so, do please say hello.